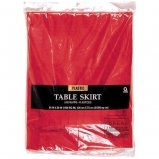 Apple Red Solid Color Plastic Table Skirt, 14' x 29"
Brighten up any table setting with our Apple Red Solid Color Plastic Table Skirt! Our table skirt features an adhesive backing that makes it easy to stick to most rectangular tables. Table skirt measures 14' x 29".